We both have a background in food agronomy but were also passionate about beer and brewing. 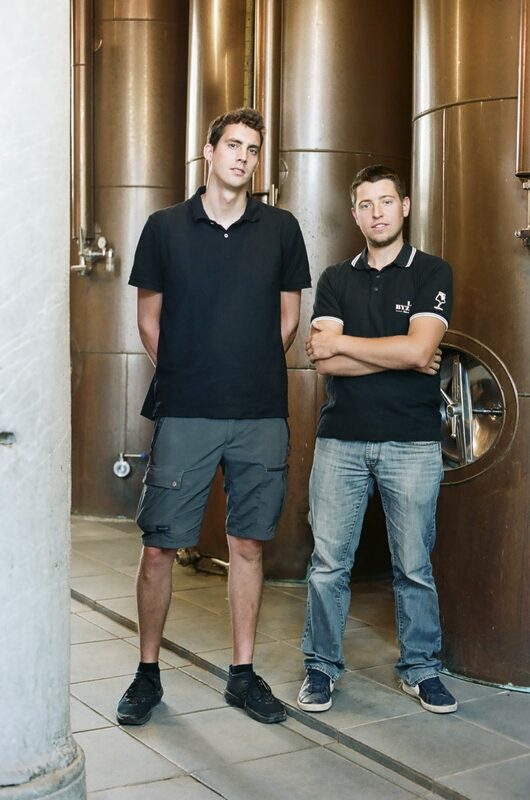 A few years ago, we had the opportunity to develop a recipe for Brasserie des Fagnes. Additionally, we’ve been working tirelessly on perfecting our organic Muscat juice-based beer La Byzance. We wanted to bring something new to the fruity Belgian beer market ourselves, and we continue to test out new brews. The possibilities in beermaking are infinite! We are quite complementary and demanding in our work, determined to offer top-quality and original beers. The creative path we embarked on these last few years. We continue to evolve and try to improve our best recipes to be able to surprise not only beer lovers, but everyone! We take the time out in our work, to make sure we don’t neglect anything. If you’re from the land of beer, it’s normal that you’re funnier than most! Jacques Brel, the best there ever was, simple as! Yvan Lacomblez aka Pipou, for the classic Ça plane pour lui. It’s always a pleasure to meet him at TRAC in Auderghem, or at the Chat-Pitre in Ixelles/Elsene. And finally Jean-Claude Van Damme, because it’s always more magical when 1 + 1 = 11! To Baromètre in Floreffe, in the Province of Namur. Enjoy their excellent cooking, a glass of our Byzance as an aperitif and a burger with Brussels Ketjep’s Dallas sauce! A walk through southern Brussels, specifically the Rouge-Cloître/Rood-Klooster in Auderghem/Oudergem, a beautiful and peaceful place for a Sunday stroll. A quick detour through Parc du Bergojepark, and you’re right by Brussels Ketjep! Mayo, mayo, mayo! Or for a special combination, mayonnaise with Rwandan pili-pili! It was actually through BK’s Sylvain, who let us taste his very first samples – instantly approved, of course! A Coluche classic: Why do we make non-alcoholic beers? Because there are those who don’t enjoy being drunk, but who love to take a piss. Because there aren’t actually that many dikkeneks in Belgium!